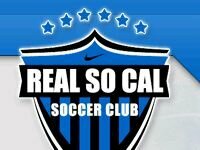 Real So Cal is one of the most successful and highly respected youth soccer organizations in the United States. The program supports over 750 competitive players on 53 teams from under 9 to under 19 boys and girls as well as a 2500 player recreational league. Players can begin in our recreational program at age four and continue developing as a player with us through the age of eighteen. There are few programs in Southern California where this process is possible.